in the celebration 50 Years Bruges Cathedral Concerts 2003. 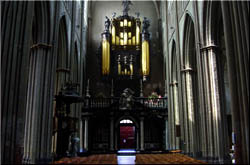 Theme of the year: "Four Centuries West European Organ Music". in the commemoration of 50 years of his death. Excellent live recording of the complete concert available at www.el-Organo.com !